ISLAMABAD: Acknowledg­ing the hardship faced by farmers because of unfavourable weather conditions, falling income and declining trend in prices of agricultural commodities in domestic and international markets amid rising cost of production, Prime Minister Nawaz Sharif announced a relief package of Rs341 billion on Tuesday to revive the farm sector. The package provides a direct benefit of Rs147bn to small farmers across the country whereas an additional loan of Rs194bn will be available to the agriculture sector. Addressing a farmers’ convention at the Jinnah Convention Centre, the prime minister said his government had decided to provide a cash support of Rs5,000 with immediate effect to the growers of cotton and rice as a direct relief. The amount will be disbursed among the farmers owning a maximum of 12.5 acres of land. It will cost the government Rs20bn. The amount will be equally shared by the provincial government concerned. Mr Sharif said that despite a bumper crop, rice growers were facing an uncertain situation because of falling prices in the international market. The decline in prices had badly affected the rice export. With the new rice crop coming up and abundant rice in stocks, the growers as well as dealers were facing difficulties which would be ameliorated through measures to be announced soon. The Ministry of Commerce has been directed to explore markets in Iran, the Middle East and other countries for rice export. The federal cabinet, at a meeting before the convention, had approved the package. SUBSIDY FUND: The prime minister also announced that the government was establishing a Rs20bn subsidy fund aimed at reducing prices of the most essential fertilisers. The fund, to be equally shared by the federal and provincial governments, would help bring down the prices of potassium and phosphate fertilisers by Rs500 per bag. The government spends a huge amount from the national exchequer on the import of urea. This year, the prime minister said, an amount of Rs25bn had been set aside to provide fertilisers to farmers at subsidised rates. He said the local fertiliser companies had raised the price of fertiliser by Rs200 per bag and the government was negotiating with them to restore the old rate. He expressed the hope that the increase would be withdrawn and asked the chief ministers to ensure the cut by Oct 1. They have been asked to devise a monitoring system at the tehsil level to ensure that the entire benefit is passed on to growers and no one takes even a rupee illegally. LNG SUPPLY: Mr Sharif said the government had decided to supply liquefied natural gas (LNG) to fertiliser factories to increase production of urea and save precious foreign exchange. He said the farmers were facing a decline in their income because of the downward trend in prices of agricultural products and increasing cost of inputs like seeds, fertilisers and pesticides. Mr Sharif said the government had decided to bear the cost of premium against loans sought for crops. The measure will entail an expenditure of Rs2.5bn and benefit some 700,000 small farmers. Farmers would not feel burdened to repay loans in case of loss to crops by a disaster, he said. CONCESSION IN TARIFF: He said the government would provide Rs7bn in concession to farmers in electricity tariff. In the current fiscal year, a concessional rate of Rs10.35 per unit has been fixed for peak hours and Rs8.85 for off-peak hours. The payment of old bills can be made by Dec 31. Sales tax on bills amounting to Rs7bn will be paid by the provincial governments. Under the arrangement, the prime minister said, farmers would get a benefit of Rs14bn to energise their tubewells for irrigation purposes. 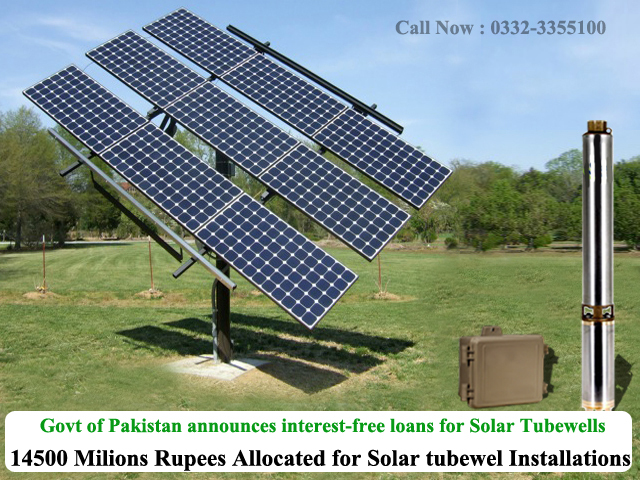 INTEREST-FREE LOANS: Mr Sharif announced interest-free loans for farmers with 12 acres or less to install solar tubewells or convert the existing ones into solar. Mark-up on the loans will be paid by the federal government. The project will cost Rs14.5bn. The government will provide relaxation in turnover tax to rice millers as compensation during 2015-16 to minimise their losses. Similarly, there would be a tax holiday on income tax for the cold chain industry trading in agricultural products, fruits, vegetables and fish, the prime minister added. The government has reduced sales tax from 17 per cent to 7pc on local purchase or import of farm machinery used for tilling, seed sowing and harvesting as well as storage and irrigation. RELAXATION IN WITHHOLDING TAX: He said the government had given relaxation in withholding tax on supply of fresh milk and poultry. Now fish supply has been included in this package. The purpose is to bring agriculture on a par with new technologies which will reduce cost of production and increase exports. The government would spend Rs15bn on this scheme, he said. LOAN GUARANTEE: The prime minister also announced a 50pc guarantee scheme on loans given by commercial and micro-finance banks to farmers. Under the scheme, 300,000 small farmers who have five acres of irrigated land and 10 acres barani land can obtain a loan of Rs100,000 without collateral. The scheme will cost the government Rs30bn. Not only rice growers but traders have also suffered losses. They owe banks Rs34bn sought against purchase of rice. For the return of these loans, the government, the State Bank and commercial banks have devised a procedure under which the loan period would be extended to June 30 next year. Kia ap is scheme ki full copy e-mail kr skty hain.